STANFORD, Calif. – The No. 18 Oregon volleyball team picked up a huge win on Friday night to open the Big Ten/Pac-12 Challenge, putting together a complete team effort to knock off No. 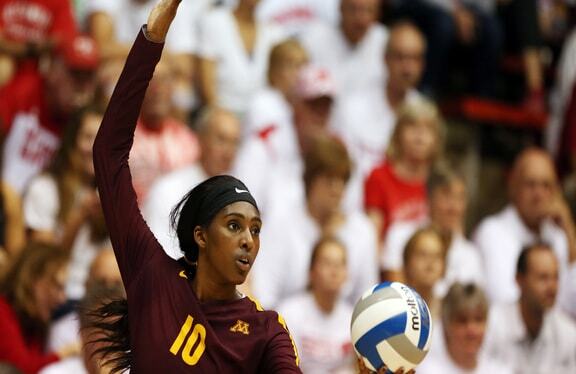 1 Minnesota in four thrilling sets, 25-23, 25-23, 25-27, 25-23, in Maples Pavilion. The Ducks (5-2) hit .298 as a team and outperformed the top-ranked Gophers (5-1) in nearly every statistical category to record the program's first win over a No. 1 ranked team since Oregon defeated Penn State in the 2012 Final Four. "I think we're really good, I've thought this the whole time, but I just really wanted to see how we would compete against the best competition," said head coach Matt Ulmer. "This is why we scheduled this way. I was disappointed with our first weekend because I thought we didn't go out and we didn't fight and we let the big points escape us. We found ourselves with a lot of big-point opportunities tonight, everything was a deuce set, and I thought we really executed well down the stretch. Really proud of our team and just the way that we handled ourselves. What a night to be a Duck. "I think our ceiling is really high, I don't even think we're close to it, so I'm excited to see where we go from here." How it Happened: Ulmer had been seeking more consistent scoring out of Oregon's left-side hitters entering the weekend, and seniors Lauren Page and Lindsey Vander Weide stepped up to the challenge from the get-go. Page was fantastic in the first set, putting down six kills to pace the Ducks to a 20-15 lead. Minnesota scored seven out of 10 to pull even, 22-22, but Vander Weide's fourth kill put Oregon up by one, and Ronika Stone broke a 23-23 tie with a kill before a Minnesota error secured the opening-set win for the Ducks. Minnesota came out in attack mode after dropping the first set, scoring the first four points of the frame and opening up a 13-7 lead. The Ducks pulled within a point on multiple occasions before the Gophers pushed their lead to three, 22-19, but a pair of Minnesota attack errors and another Stone kill pulled it even, 22-22. After the Gophers took a 23-22 lead, Vander Weide, Stone and Page answered for Oregon with three consecutive kills to help the Ducks complete the comeback and take a 2-0 lead into intermission. A crazy back-and-forth third set saw the Ducks and Gophers play to a 21-21 tie before Minnesota scored three in a row to earn set-point. But Oregon wouldn't go away, as once again it was Vander Weide, Stone and Page with kills to fuel a 4-0 run that gave the Ducks match-point, 25-24. Oregon was unable to complete the sweep, though, as Vander Weide's serve went long and a pair of UO errors followed to send the match to a fourth set. Minnesota used a 5-0 run to take an early 5-1 lead in the fourth, but the Ducks responded and played their way back to a 16-16 tie. The two teams traded points before the Gophers scored two in a row to take a 21-20 lead, but junior Willow Johnson began to take over with three kills in four points to make it 23-22, Oregon. A Minnesota error gave the Ducks match-point, and Stone put the exclamation point on the night with a powerful kill to complete the win over the top-ranked Gophers. Who Stood Out: Stone led the Ducks and was one of four players with double-digit kills, hitting an astounding .615 with a career-high 19 kills while adding five blocks. Page enjoyed a breakout night with a career-high 16 kills on .324 hitting, Johnson also had 16 kills and Vander Weide put together her most complete match of the year with 14 kills, six digs, three blocks and an ace. Senior setter August Raskie was terrific with 66 assists, a gaudy number for a four-set match, while adding eight digs and two kills, and freshman Brooke Nuneviller was fantastic defensively with a season-high 28 digs. Brooke Van Sickle recorded three aces to lead the Ducks to a strong night at the service line. What It Means: The Ducks have set sky-high expectations for themselves in 2018, and a win over the top-ranked Gophers is a terrific stepping stone towards making those goals a reality. Oregon has now played three matches vs. top-five teams in its first seven matches, with another on tap Saturday against No. 5 Penn State. The Ducks had already proven they have the talent to go point-for-point with elite teams, but Friday's performance was a great example of the mental toughness that Ulmer said Oregon had been previously lacking in big moments. Notable: Ulmer now has two wins over top-five teams in his first 35 matches as Oregon's head coach … The Ducks outperformed the Gophers statistically in hitting percentage (.298-.295), kills (74-63), digs (65-63), assists (72-54) and aces (5-2) … Raskie's 66 assists are the most since Lauren Plum had 68 vs. BYU in the 2012 Sweet 16 … Van Sickle's three aces pushed her Pac-12-leading total to 14 on the season … The Ducks and Gophers are now tied in the all-time series, 3-3. The #Gophers fall to Oregon in four. Up Next: Oregon will look to go 2-0 at the Big Ten/Pac-12 Challenge with another win over a top-five team on Saturday when the Ducks take on No. 5 Penn State at 2 p.m. PT (Stanford Live Stream).